Want your children to eat healthy foods? Create a nutritional home. 1. Do not restrict food. Restricting food increases the risk your child may develop eating disorders such as anorexia or bulimia later in life. It can also have a negative effect on growth and development. 2. Keep healthy food at hand. Children will eat what’s readily available. Keep fruit in a bowl on the counter, not buried in the crisper section of your fridge. And have an apple for your own snack. “Your actions scream louder than anything you will ever tell them,” says Sothern. Remember, your child can only choose foods that you stock in the house. 3. Don’t label foods as “good” or “bad.” Instead, tie foods to the things your child cares about, such as sports or appearance. Let your child know that lean protein such as turkey and calcium in dairy products give strength to their sports performance. The antioxidants in fruits and vegetables add luster to skin and hair. 4. Praise healthy choices. 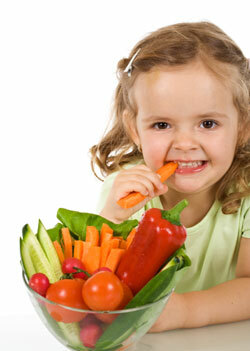 Give your children a proud smile and tell them how smart they are when they choose healthy foods. 5. Don’t nag about unhealthy choices. When children choose unhealthy food, ignore it. Or if your child always wants fatty, fried food, redirect the choice. You might try roasting potato sticks in the oven (tossed in just a bit of oil) instead of buying french fries. Or, if your child wants candy, you might make fresh strawberries dipped in a little chocolate sauce. Too busy? Then keep naturally sweet dried fruit at home for quick snacks. 8. Prepare plates in the kitchen. There you can put healthy portions of each item on everyone’s dinner plate. Your children will learn to recognize correct portion sizes. And you may find your slacks fit better as well! 9. Give the kids some control. Ask your children to take three bites of all the foods on their plate and give it a grade, such as A, B, C, D, or F. When healthy foods – especially certain vegetables — get high marks, serve them more often. Offer the items your children don’t like less frequently. This lets your children participate in decision making. After all, dining is a family affair. 10. Consult your health care provider. Always talk with your child’s doctor or nutritionist before putting your child on a diet, trying to help your child gain weight, or making any significant changes in the type of foods your child eats. Never diagnose your child as too heavy, or too thin, by yourself. It’s all about gradual changes, it’s not overnight, and it’s an uphill battle for parents. But the food smarts your children will learn from you can protect them for a lifetime.